Pilots have long called it the “$100 hamburger run”: a hop from one small airport to another in search of jaw-dropping aerial views and a delicious lunch at flight’s end. With flying a dreaded event these days—lost baggage, cramped seating, delays—we often forget that it used to be fun. But it’s possible to recapture the pleasures of air travel without investing in your own vintage Piper (or $2 million miniature Cirrus jet). 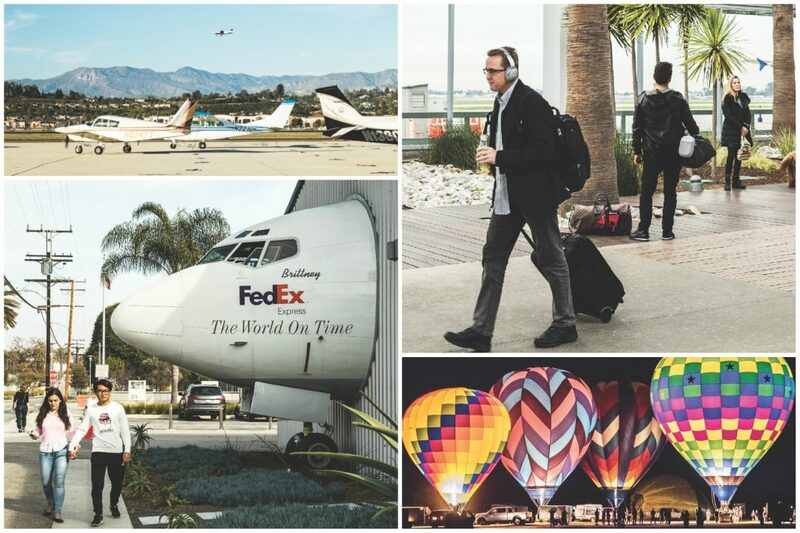 Nestled within an hour or so of Los Angeles, a number of time-warp general aviation airports are open to private pilots, corporate travelers, and celebrities looking to skip town in their sweats. But these tiny outposts also welcome aviation buffs or those simply looking for an afternoon of plane spotting, with or without the kids. Through a quirk of state law, owners of rare or historically significant aircraft are exempt from paying property tax on them provided they display their planes at least 12 days a year and don’t fly them commercially. That means that many airports hold open-hangar days and fly-ins. Visitors can view ancient Cessnas or World War II bombers, and children might be allowed to climb into a cockpit, pilot willing, or take a test flight. With today’s high fuel prices, that burger run is more likely to cost a flier $200 than $100, says Jorge Rubio, acting director of Camarillo’s gem of a pocket-size airport. For drivers, the cost is negligible. Whatever. Just buckle up and go. 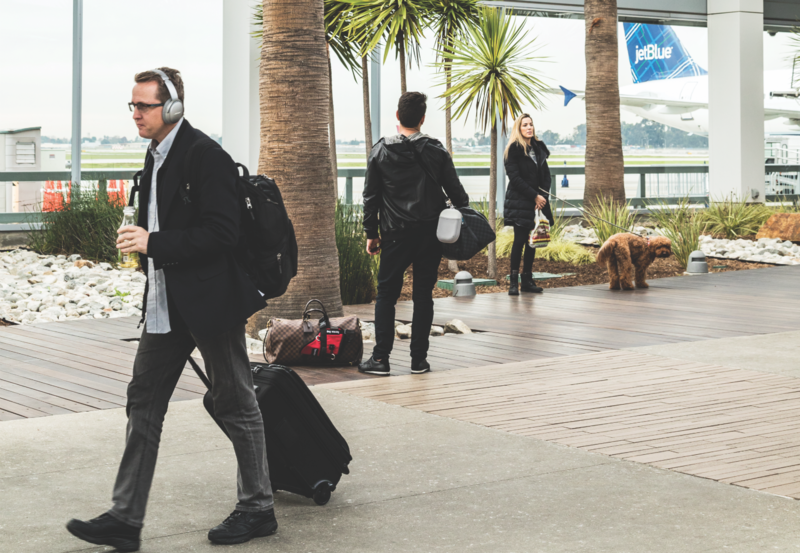 It’s not exactly far-flung, but founded in 1923, Long Beach Airport has retained a small-town aura and is too charming to pass up. Rows of impossibly tall palm trees lead the way to a main terminal building that is a treasure of Streamline Moderne architecture: Its exterior echoes the lines of a plane, with a nod to an ocean liner, complete with portholes. This would be good enough on its own. But inside, visitors find intricate tile work designed by California-born Grace Clements during the New Deal/Works Progress Administration era. Unveiled in 1941, then hidden for years beneath carpet, the colorful first-floor mosaics came to light again during routine maintenance in 2012. Seven mosaics in all, composed of 1.6 million tiles in 32 colors, depict what was then the City of Long Beach’s seal as well as images referencing oil, shipping, and the ocean, while Clements’s map of the Western Hemisphere suggests possible future routes for the commercial air industry. Jet Blue, Delta, American, Southwest, and Hawaiian airlines might take off and land here these days, but there are no bridges or boarding ramps, so passengers embark from and disembark to the tarmac, adding to the old-timey travel atmosphere. The concourse, created from slatted ipe wood to resemble a boardwalk, takes travelers past more palms and drought-tolerant landscaping, with solar rays providing about 30 percent of the arrival-and-departure area’s energy. It’s the perfect way to arrive in California. It’s also the perfect way to leave—with a twinge of regret. One of the only-from-Long-Beach favorites situated in the terminal lounge’s mini restaurant row is George’s Greek Cafe, which offers succulent charcoal-grilled kabobs. More formal: At a table on the deck of the Boathouse on the Bay offshoot, nervous fliers can fortify themselves with a sangria or Bloody Mary, breakfast burritos, fish-and-chips, or mahi-mahi sandwiches. On the second floor of the main terminal, see a trove of aviation memorabilia, including a tribute to airport founder and barnstormer Earl S. Daugherty. He began flying in 1911, landing his biplane on the beach until, in 1920, he developed the flying field where Amelia Earhart would be inspired to become a pilot. Also on the second floor, a Streamline-style circular room, furnished with 1940s-era armchairs, doubles as a nursing station for mothers with babies. Enjoy primo plane spotting while you can: As the result of the city reaching an agreement with the Federal Aviation Administration, Santa Monica Municipal Airport will close in 2028 to make way for an enormous park. Meanwhile, the administration building on Airport Avenue offers a deck with a great view of the runway, which is usually dotted with colorful Cirrus, Beechcraft, and Piper planes in the middle of taking off or landing. Pioneer female aviators Florence Lowe “Pancho” Barnes, founder of the original movie stunt pilots’ union, and Amelia Earhart took off from Santa Monica in 1929 for the first Women’s Air Derby. Julia Roberts, Tom Cruise, Arnold Schwarzenegger, and Steven Spielberg have been said to keep jets here, and Harrison Ford famously crashed his World War II open-cockpit Ryan on a nearby golf course. Though this airport lacks the rustic charm of some of the quainter outposts, it still pulls off a cozy community feel with its dog park, hangar artist studios, and an outdoor antique and collectibles market held the first and fourth Sundays of every month (where shoppers can snap up bargains in vintage clothing, Bakelite and other jewelry, furniture, and California paintings). 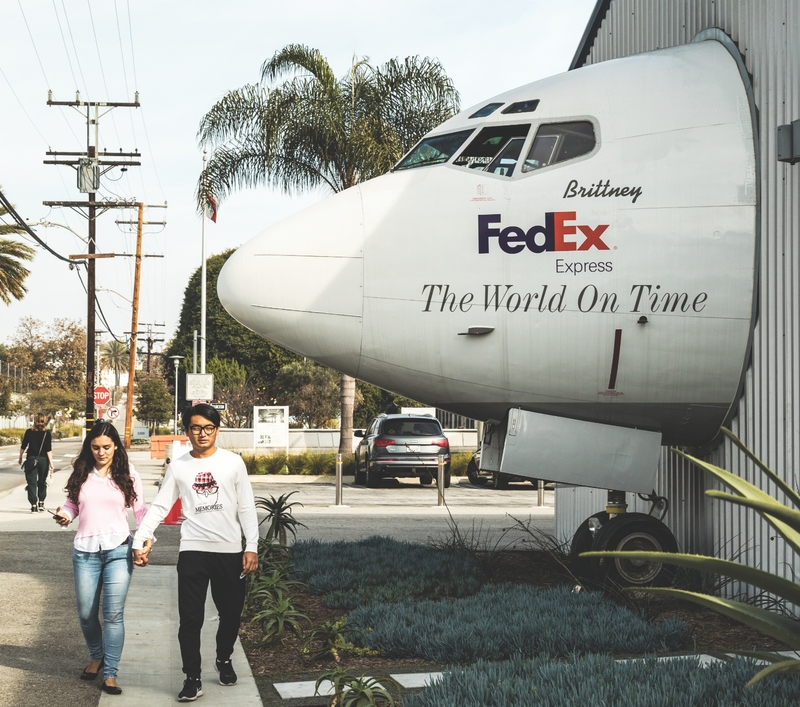 Since the city plans to retain cultural and educational uses, these features might survive the airport’s closing, as could the sustainable-landscape demonstration gardens, home to kumquat and western redbud trees, California wild roses, and lilacs. Barker Hangar, which hosts the People’s Choice and MTV Movie awards, might even maintain its status as a key coastal space for glittery A-list events. Still, pilots worry that, with the airport gone, important firefighting and other emergency and humanitarian groups that keep their helicopters here will follow. Try smoked-salmon Benedict for breakfast or an unusually tasty veggie burger with lashings of avocado and melted jack cheese for lunch at Spitfire Grill. Planes are barely visible from the coffee shop’s two patios, but a bleacher viewing spot is a short walk across the street. The Museum of Flying includes rotating aircraft displays and the California Aviation Hall of Fame. Observation-deck birthday parties include airport stickers, balsa wood plane assembly, and an optional aircraft for young aviators to sit in (the best part? A friendly pilot is included). Once a 1940s landing strip and later Oxnard Air Force Base, this airport by the Cold War era was home to Voodoo interceptor jets equipped with nuclear missiles ready to protect Los Angeles. 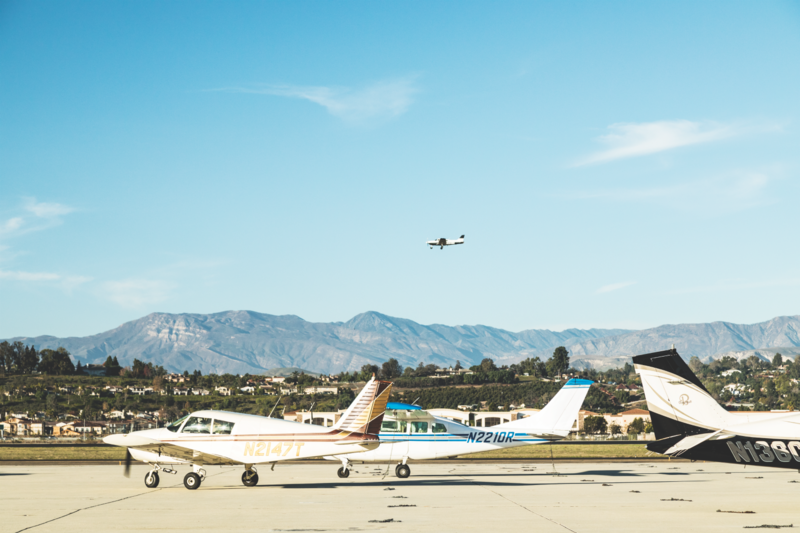 The Air Force left in 1969, and now the facility, owned by Ventura County, has a gentler vibe despite its 160,000 annual takeoffs and landings and being ranked among the 30 busiest general aviation airports in the nation. Known to pilots as one of the top sites for airport eats, Camarillo’s bustling Waypoint Cafe is newly spiffed up with leather booths and a sleek counter courtesy of Jim Magglos, who with his wife, Linda, cofounded the fast-casual Mexican chain Baja Fresh. (Jim kept his planes at Camarillo, and after selling out to Wendy’s, he combined his dual enthusiasms for flying and food.) Guests can hang at umbrella-covered tables overlooking the runway while noshing on huge Belgian waffles, omelets accompanied by fluffy biscuits, giant burgers, or the barbecued tri-tip lunch special. As parents drink mimosas on the terrace, kids can listen to real air ops at a child-size play control tower, then flap their arms and pretend to taxi down a miniature runway near a pergola-shaded viewing area. April through July you can pop over to nearby Somis to handpick strawberries at Underwood Family Farms. Loading up at the fruit stand opposite the airport entrance is acceptable, too. Charter a private jet through Channel Islands Aviation to visit Santa Rosa Island, and spend the day touring its Torrey Pine Forest and white-sand beaches. Drop in to the World War II Aviation Museum to see fighters. Book in advance for rides in planes ranging from an Aircoupe and training aircraft to a rare P-51 Mustang bomber. Cost: $80 and way, way up for 20 minutes or more, depending on the plane. The popular Wings Over Camarillo air show, held in August, features a STEM pavilion where kids can build a Lego airport or create and maneuver their own flying objects. Like so many regional airports, Chino was a training facility for the Army Air Corps during World War II. Now it’s the site for 900 private aircraft and corporate jets, with its Planes of Fame Air Museum sheltering the largest collection of military aircraft in the Western U.S., including Dutch Fokkers, German Messerschmitts, British Sopwiths, and more (some of them replicas). The museum is open daily for guided individual and group tours, and there’s a gift shop offering collectibles like Rosie the Riveter socks and onesies, P-47 sweatshirts, and fur-lined flight helmets for tykes (and adults, if that’s your thing). 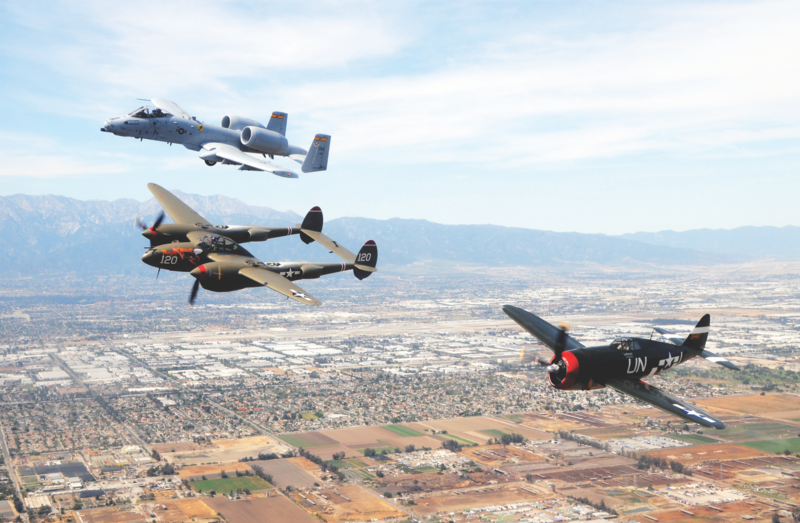 What Chino is really known for, though, is its annual Planes of Fame air show (slated for May 4 and 5 this year). Aviation enthusiasts from around the world converge here because they can expect to see old warbirds take off on more than 50 flights a day. Many have made appearances on the television show Baa Baa Black Sheep and the miniseries War and Remembrance, and, more recently, in the films Always, The Kid, Valkyries, Rocketeer, Pearl Harbor and Dunkirk. At this year’s event, the star attraction will be a U.S. Air Force F-16 Viper fighter jet—officially named a Flying Falcon—which will perform loops and rolls to the delight of neck-craners below. World War II, Korean, and Vietnam warplanes will also be on hand for flight demonstrations. At the nearby Yanks Air Museum, you can see even more old-school jets, from restored rare and historically significant American World War II fighter planes to dive and torpedo bombers. Flo’s Airport Cafe is a folksy joint famed for its biscuits and gravy—“real down home tasty goodness,” the menu brags—and is possibly the only coffee shop left in California to offer cottage cheese and peaches as a lunch option. For heartier appetites: a 12-ounce New York steak, pork chops, or fried chicken. Fasten your mountain bike to the car, and take a ride through Chino Hills State Park to get a glimpse of poppies, violet owl’s clover, and lupines between February and September (March is peak season). No bike? No problem—there are miles of trails to hike. Visit nearby Chino Hills and admire the sandstone exterior and Carrara marble interior of the vast BAPS Shri Swaminarayan Mandir Hindu temple, an edifice that was hand carved in India and shipped in pieces to be assembled here. Attend one of the four daily worship services, then try the vegetarian fare at the casual café. Sitting off picturesque Highway 126, which whips from the Santa Clarita Valley through vistas of orange groves and tree nurseries, Santa Paula Airport is where the actor Steve McQueen once kept his planes. Tucked away next to the Santa Clara River with close-up mountain views, this airfield opened in 1930. Without a control tower, it holds heaps of nostalgia for the good old days of flying: Weathered hangars protecting the airport’s 200-plus private planes are open to the public for the Aviation Museum of Santa Paula’s Chain of Hangars Day, the first Sunday of every month. Expect to find multiple immaculately maintained aircraft, including a gleaming 1936 Ryan, a Bucker Jungmeister, and a Bucker Jungmann dating to 1939. Other hangars house personal memorabilia collections, including one with ultracool midcentury (and older) home radios. Views of planes taking off and landing at the busy little airport are excellent from some areas of the hangar walk, but a small tram is on site to ferry onlookers who don’t feel like hoofing it. There are also terrific views from the patio at the homey Flight 126 Cafe, where inside booths are cushy, and the 14-ounce ham bone and eggs breakfast is billed as “so big it’s served on 3 plates.” Next door, where the Hangar Bar and Grille’s picture windows overlook the runway, you can expect a prime rib dinner special Wednesdays, karaoke Thursdays, and ribeye steaks and music Saturdays. The Young Eagles group offers kids their first plane ride for free (expect it to take about 20 minutes). Adults are in for something even more exciting: an hourlong StarLite Balloon flight that touches down for a champagne picnic in a lemon orchard. 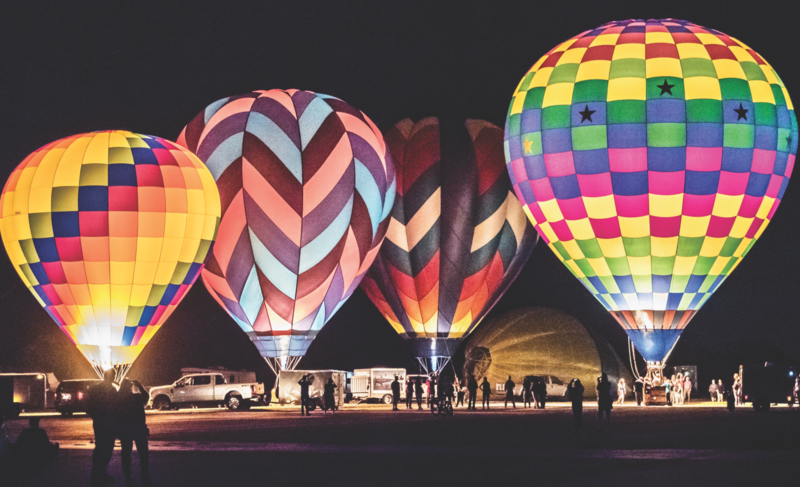 Head back for the airport’s yearly Starlight Glow, a nighttime fundraiser for the Aviation Museum of Santa Paula that includes tethered hot-air balloon flights. On the way home, turn off Highway 126 onto Honey Lane to sample the goods in the tasting room at Bennett’s Honey Farm. The solar-powered operation sells everything from creamed honey to royal jelly capsules; we suggest snagging a honeycomb candle and a jar of wildflower honey. There was no paved airstrip at the Agua Dulce airport in the 1940s, back when B25 bombers flew training missions out of here. Now the 150-acre privately-owned airfield nestled into the chaparral-covered Sierra Pelona Mountains is the definition of a country airport. No personal or business jets are allowed, and there’s no control tower, night flying, or aerobatics. Hangars here are filled with personal planes, their pilots a mix of neighborhood people and flyers from as far away as Santa Monica; they park here, surrounded by upscale ranches, because they enjoy the rural atmosphere. A wind tee from the long-shuttered Grand Central Terminal Airport in Glendale sits on the grounds, and the airport’s water dip is a major supply line for L.A. County firefighters battling wildfires. Occasionally, while still accommodating resident pilots, the airpark shuts down for filming: The forthcoming Christian Bale-Matt Damon movie, Ford v. Ferrari, closed the place for three months last year. Usually, though, it’s quieter, with a highlight being the Texas Barbecue Fly-ins the airport throws for Agua Dulceans, out-of-town pilots, and visitors. After chowing down on burgers and hot dogs at picnic tables on a tree-shaded lawn, civilians can hit the runway to chat with aviators about their planes. Check l70airport.com for this year’s cookout dates, expected to start in February. Otherwise, aircraft displays (minus the spread of smoked edibles) happen on the last Saturday of each month. You can’t beat a shrimp taco lunch and a lemon mint ice blended on the porch at the nearby Sweet Water Bar & Grill, which overlooks sleepy Agua Dulce Canyon Road. Browse the notices advertising fainting goats and bee swarm removal at the hardware store next door, then hang out into Saturday evening for a pasta dinner with a side of live country tunes or classic rock. Hike the sandstone outcroppings of Vasquez Rocks Natural Area Park, keeping an eye out for favorite Westworld, Star Trek, or Gunsmoke locations; head off on Reyes Winery’s organized Saturday brunch and mountain hike; tackle the trails leading from Copper Horse Riding Ranch by horseback, then scout the place out for kids’ birthday parties, which include pony rides, farm animals, gold panning, games, and a homemade horseshoe-shaped birthday cake. Rent a 5,000-square-foot house on the 100-acre grounds of the Agua Dulce Winery—a splurge at $750 a night (there’s a two-night minimum to boot)—where you can take a guided barrel tour, hike the Pacific Coast Trail, and gaze at the cosmos. The lauded French eatery Le Chêne is only a short drive away. You won’t spot any planes at this Glendale facility, but it’s still worth a stop. In the 1920s the terminal was a draw for aviation pioneers, including Charles Lindbergh, Howard Hughes, and Amelia Earhart. Laura Ingalls landed here in 1930, making her the first woman to fly from New York to the West Coast. In 1933 Albert Forsythe and Charles Anderson were the first African-American pilots to make a cross-country flight. The once-glamorous airport, the first in California to offer commercial flights, fell into disuse and was later turned into an office park. Abandoned and neglected for years, the terminal and surrounding land were eventually bought by Disney to develop for office use. 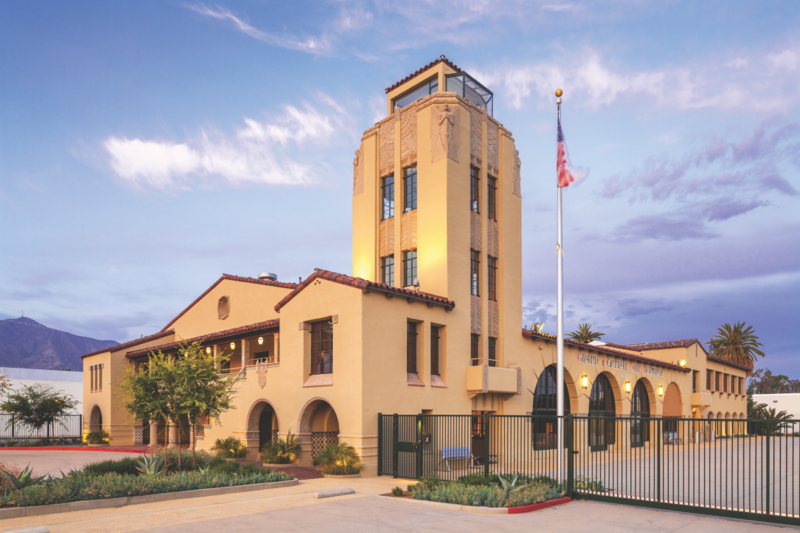 Then, in 2013, the corporation began a renovation of the Spanish Revival and Art Deco building originally designed by Henry L. Gogerty, with the new work overseen by Frederick Fisher and Partners. Hanging light fixtures and sconces were re-created, as were tiles that are indistinguishable from their predecessors. Silver paint was reapplied to waterfall architectural details and scrolled ironwork. The project earned Disney a Los Angeles Conservancy Preservation Award in 2017. On a nondescript corner a couple of blocks away, Little Ground cafe serves pulled-pork Cubano sandwiches, avocado and egg salad tartines, almond lemon tea cake, and lattes and teas, all of which can be enjoyed on its small patio. Previous articleWhy Do They Call Them the Santa Ana Winds? Ask Chris: I’m Employed at Dreamworks Animation Glendale and Hear Rumors That the Land Was an Airport. Is That True?